Dealing with what Fields has called his specialist subject in over 40 years of performing, it examines humbling love that can make you feel ten feet tall, all while The Expressions hint that these feelings may be unrequited. 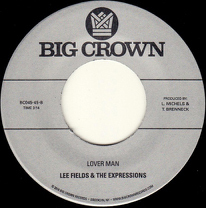 ‘Lover Man’ continues in the same vein and yet strikes a strong contrast on the flip; raw-edged funk and soul sophistication with Fields going for his notes. Whether tackling love or broader topics like the state of humanity, Fields has a very unique and honest perspective that is on display with each unforgettable performance. The Expressions have never been sharper, and they, along with Lee, have created a collection of music on ‘Special Night’ that holds court with pretty much any soul music that came before it.